JADE loves keeping you upto date with the law that is relevant to you – it is your personal information butler. JADE Alerts are delivered to thousands of inboxes around the country every morning. This short tutorial will show you how to do the basic stuff like create and edit Alerts in JADE. In 9 short steps it will also show you some new features, such as setting alerts based on citations, search terms and sections of legislation. 1. Where do your Alerts live? You will then see the option to create an Alert. 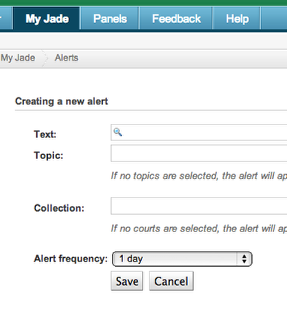 When you select “create a new alert” you will have the options to create an alert based on text, topic or collection. You can also combine these categories for e.g. If you set an alert using the text “slip and fall” the topic negligence and the collections Victorian Supreme Court AND NSW Supreme Court you would receive and alert whenever the VSC or NSWSC handed down a negligence case involving a slip and fall. 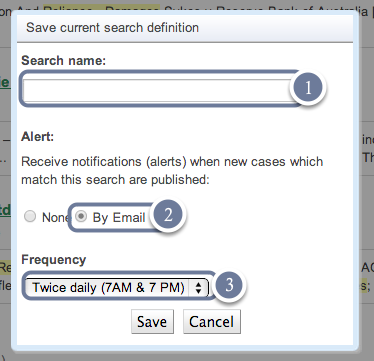 You can use the same search logic in Alerts as you do in the main search bar if you choose to use the Text field. – If results must include a keyword or phrase use a plus sign ( + ) immediately in front of the word or phrase. – If results must exclude a keyword or phrase use a minus sign ( – ) immediately in front of the word or phrase. 3. Create an alert from a search. 4. Name your alert and save. 5. Follow a case as it travels through the legal system. 1. 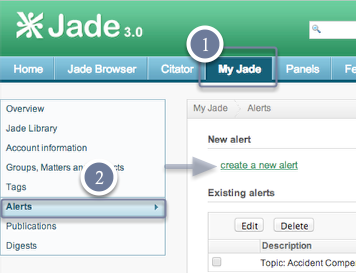 Set an alert on a case by scrolling down to the citation report (they are at the bottom of every case in JADE) and select “Alert: when this document is cited. 2. 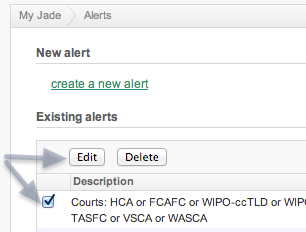 You can even go broader than just one case by selecting “Alert: list of authorities” this will create an alert that will notify you when any of the cases listed in a citation report are cited. 7. Section Alerts – name your search and save. 3. Click “Edit” on your selected Alert – the editable details appear in the upper form. You can change any of the details as described above. 4. To unsubscribe (Delete) an Alert – simply click “Delete” for that Alert. Do you have any ideas, feedback or suggestions? We want to hear from you.